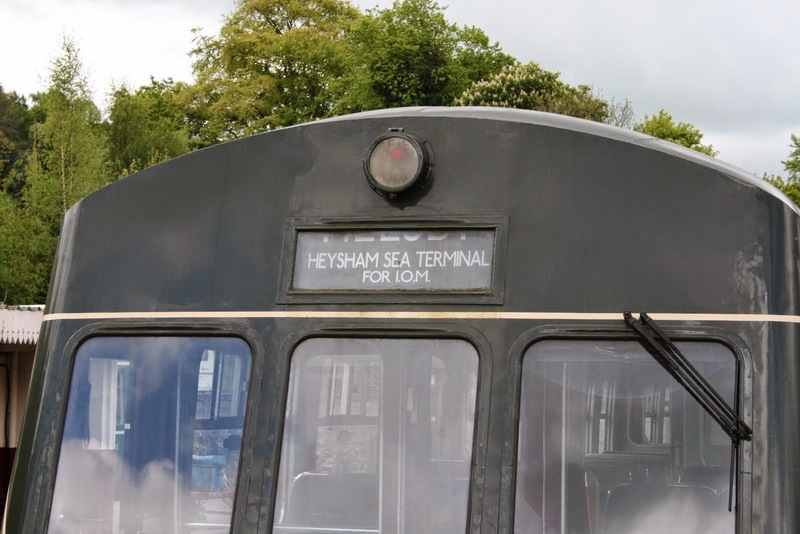 A dry and reasonably warm day which saw the passenger service operate in our usual timely manner. The DMU team overcame several challenges throughout the day and managed to work on nearly every vehicle at some stage. The PDLG finally managed to apply some paint to 33035 and work continued on Cathryn's boiler and the 8F coach respectively. 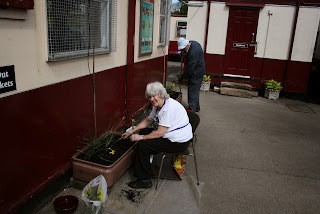 Some tidying up took place in the Passenger Department inbetween serving the customers and at Duffield, attention was turned to the flower beds to keep them looking in top condition. (Europe) carried on with preparing the operational SK for the summer season, with further work to make this carriage the best in our hauled fleet. The DMU team ate cake and looked at their parts. The PDLG carried on with the Siberian camouflage programme for the class 33.
far parts of the empire without a spade. The railway is primarily operated and restored by volunteers, but as we grow, we occasionally need to employ some paid staff to help us ensure that we can deliver promised services to our customers. We are looking for an enthusiastic individual to join our Pullman Buffet catering team. The role will include serving customers, serving food and drink, cleaning duties and other kitchen duties as required. As this is a customer-facing role, the successful applicant will need to be polite and courteous to our growing customer base, as well as be flexible in the hours of work. As this is a seasonal business, the hours are to be discussed with the line manager but may be any day of the week, including weekends and may not be a set pattern each week, however we may be able to work round other commitments too. Rate of pay will be minimum wage on an hourly basis. To apply, please e-mail your CV and covering letter to ticketoffice@e-v-r.com. A dreary wet day that had all the signs of being a failure in revenue terms but we were most pleasantly surprised by the volume of passengers which we suspect needed a venue in this half term week that sheltered them from the rain. I am most grateful, as ever, to the train crew, EVRA shop and Model Railway steward together with the Booking Halls and Pullman Buffet Car for making our guests welcome and taking a satisfactory amount of money from them. Within Wirksworth Yard our Network Rail customers completed their Derailment Assessment course which also added to the Pullman Buffet Car's lunchtime take. We were taken aback by a fleet of Police cars with a request to go "on track" to hunt down a burglar who escaped onto our Railway. He or she must have been quite shocked by the amount of orange around our premises and decided an alternative course would be wise. The PWT focused on signal post construction for the Shottle project and the Booking Hall at Wirksworth processed an unremitting succession of telephone reservations for Afternoon Teas and Station Master's VIP Pullman Luncheons. Once again many thanks to the customer facing teams and a special mention for the Third Man who had an exhausting and wet day. The 1515 Duffield to Wirksworth had tail traffic in the form of a Brakevan that had been the radio shack over last weekend. This reflects something that was quite common years ago and is illustrated in the accompanying video. A wet, cold and miserable day where we welcomed a phalanx of Network Rail engineers on day one of their derailment investigation course. One of the photos illustrates where the catastrophic derailment has occurred where the teams have to ascertain the cause. The second photo shows the PWT operating the user friendly "Jim Crow", they really wanted an hydraulic version, which is part of "rehanding" the point blades of the crossover. The LMS Brakevan has emerged from the Maintenance Facility following repairs to the roof canvas with a few touches remaining to introduce it back into service. Within the Maintenance Facility Iris and 50253 have been transposed so that the painting could continue today. The LCC dealt with 55006 and the two car set. We also discussed, God help us, some of the logistics for this year's Santa programme. The Pullman Buffet Car provided lunch for today's customers and the Booking Hall, apart from taking another experience booking, dealt with a large number of luncheon bookings. In spite of the weather a most productive day. A dull and unpromising day turned out to be quite successful for our train service supported by the Booking Halls and EVRA shop together with the Pullman Buffet Car that also very successfully welcomed today's Afternoon Tea customers. The photo's show one of our unsung heroes in the form of Allison Leather, who confessed to a little history of leather work!, saddle stitching the bellows of the Third Open corridor connection. This was the first of four such sowings that will deal with one end of the coach so she may at it for some time. The rest of the LMSCA continued with their work on the TO and BTO. The DST put Henry Ellison through a series of tests on the Incline between our scheduled Ravenstor services and seem to have identified the cause of the hot boxes the locomotive was experiencing. They also continued work on Cathryn. The VCT dealt with an overhanging tree on the Incline before services commenced and then went on to tackle a major tree trunk felled some time ago at 49 steps reducing it to manageable segments. They had a four man team and also enjoyed the warmth of a brash fire there. The PWT turned their attention to the various items of pointwork that will be installed on Road 2 at Wirksworth to form the new crossover. This is not quite straightforward as the new installation will be the reverse of what has been recovered requiring a lot of modification and hand cranked rail bending. The Booking Hall at Wirksworth had another busy day dealing with Amazon Luncheon bookings which now exceed 320 and a lone worker continued to prepare the roof of the 8F's support coach for repainting. The best day of a miserable Bank Holiday weekend which never brightened up and the rains started at around 1530. Nonetheless, today was the best revenue day of the three and my thanks go to the teams that manned the Booking Halls, the Radio Shack at Duffield, ran the standard and narrow gauge trains, opened the EVRA shop and Model Railway exhibition. Thanks go specially to Ryan who stepped in to the Third Man's position at the last minute and duly enjoyed a soaking at the end of the day. The Pullman Buffet Car had quite a successful day as passengers were driven inside the coach for shelter. Derailment markings were emphasized in the Wirksworth Yard ready for the Network Rail Course later this week and the Course Leader was entertained to a footplate ride on No3 to his obvious pleasure. The LMSCA lone participant laboriously refurbished the wooden strips that run above the seats on the Mark 1 SK so that they cater for 4 passengers each side of the compartment rather than the previous three - it's all about revenue yield! Preparation and painting was also the order of the day. 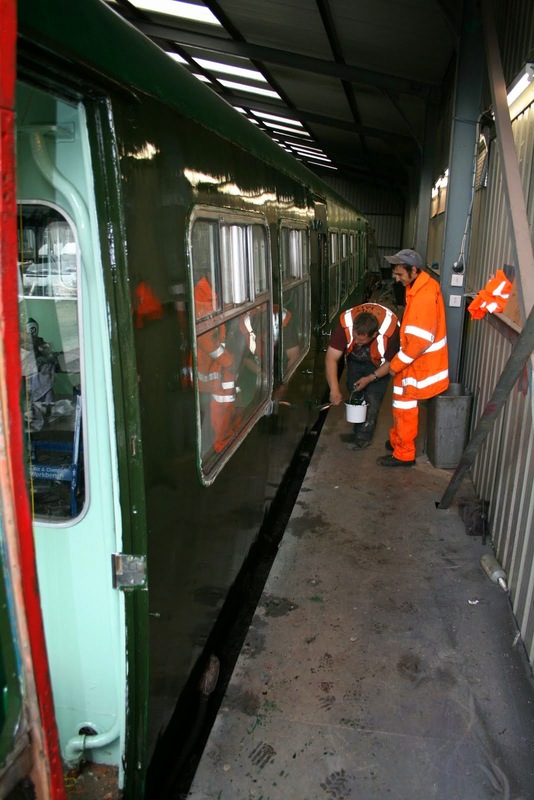 This included the Pioneer Diesel team preparing 33035 for a partial repaint in advance of its holiday on the Keighley and Worth Valley Railway together with the dmu team simultaneously applying gloss to both Iris and 50253. Photos of these activities are attached revealing a new apprentice dmu painter. A new indicator box has been manufactured for 50253 allowing codes to be displayed such as A1, A2, A3 and A4 etc. Sir Nigel Gresley would have been proud. The Head of Gardening continued her work on the Wirksworth Station garden and, all in all, it was quite a productive day. PS - I tried to include a photo taken by Richard of a period at Duffield where all three platforms were occupied by dmus - must be a first - but technology has defeated me. Will try again. A rather damp and cold start didn't exactly bring out the Bank Holiday hoards but we pottered around happily for most of the day, and naturally by the time we had finished the sun came out. Down the yard, the Austerity Team waited for the morning's heavy dew to clear before getting more paint on the frames, and in the shed, protected from the heavy dew, the DMU Team worked steadily on the interior trim of unit 50253 and on her headcode box. Nearby, routine maintenance took place on both the class 33 and the class 31 and this seemed to involve a steam cleaner. The quiet progress of the day was therefore little interrupted by excitement, unless mowing the grass could be thought of as excitement. Typical English bank holiday weather greeted us this morning on day one of the Wirksworth Carnival. Despite the grey skies and forecasts of tropical downpours our first service train was pleasantly busy resulting in a full to capacity incline service. Down the yard the LMSCA, DMU group and Oaks enterprises were duly engaged on their respective projects. The Pullman Buffett was busy throughout the day as was the model railway. Today we sold a further 54 Station Master luncheons and the booking hall staff were extremely busy taking the resulting telephone bookings. We played host to a number of visitors from near and far today. One visitor I chatted with was from Washington D.C. and worked for the US Government as a bank regulator. It's amazing the people you meet on the 13.53 train to Ravenstor! Finally the sun came out this evening just in time for our first cheese and wine land cruise. A rather damp Wirksworth greeted us this morning, rather damp that is after a huge downpour yesterday which deposited an inch and a half of mud on the Booking Hall doorstep, all of which has had to be dug out and washed down, as well as large amounts of detritus the platform. 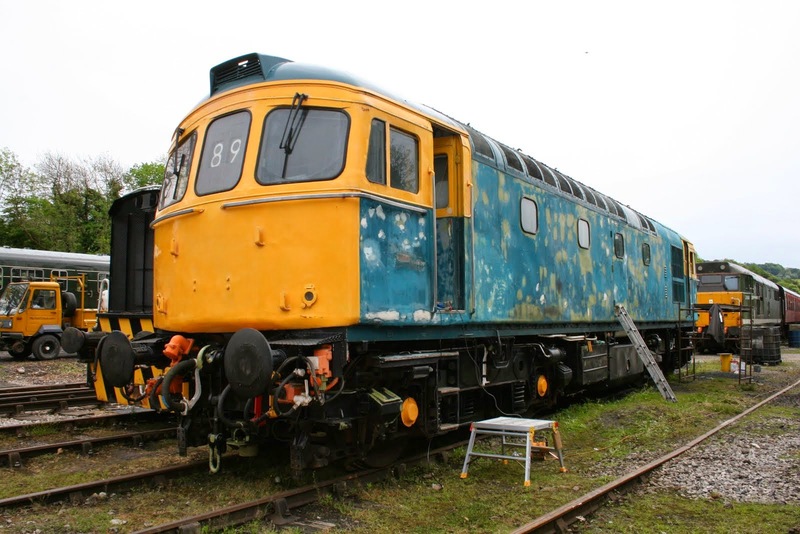 We hosted a Diesel Driver Experience and various things boggled through the station during the course of the day, including a sanded down class 33. In the yard, Smith's Industries scrabbled the roof of the 8F's support coach in preparation for yet another dose of coach roof painting. Painting also continued in the shed with the Met Cam receiving a further dose of greenery. One of the road-rail landrovers got a jolly good seeing to from Brassington Field and is once again nearly white. The duff toilet handle in the Extra Ladies has been replaced and should be rather more resistant to ladies forceful flushing than its predecessor. a convenient biker and the Duffield desptach box was filled with a vast selection of urgent items. Its collector tomorrow should lift it carefully in case of getting a surprise hernia. A quite peculiar day which was pleasant until the late afternoon when water descended of biblical proportions which will necessitate a thorough examination of the line tomorrow. Happily this can be undertaken by the drive a Diesel Day participant but we must be prepared from some emergency work before the Bank Holiday weekend commences. We said goodbye to "Bubble Car" 55012 as it journeyed to the Weardale Railway for the summer and the dmu team accomplished much re-arrangement of the Yard to prepare for next week's events. There was significant progress with Iris where lining out commenced as illustrated within the confines of the Maintenance Facility. The team also completed the major "C" service of our resident "Bubble Car" 55006. Thanks go to Alan Taylor for restoring and refitting mile post 137. These original Midland Railway lineside furniture items have largely survived over the many years they have been in place and it is good work that the 137 mile distance from St Pancras is now whole again. The Booking Hall gathered more lunch customers in and the Pullman Buffet Car entertained a steady trade of visitors. Another nice day in Wirksworth which featured the grand opening celebrations of Line 1 in Wirksworth Yard. The celebrations consisted of a large cup of tea and many biscuits. In the engineerium, work continued on the C Exam on W55006 with special attention being paid to the drive shafts. Iris received much sanding and Field Enterprises whipped out his self-separating paint for 50253. 55012 leaves at the crack tomorrow so it was moved to the car park. The LCC continued cleaning around the station and the buffet was quite busy. The Booking Office answered 157 phone calls from Amazon customers to keep them busy. An unexpectedly pleasant day that allowed the VCT to draw to conclusion their splendid efforts north of the Cemetery Lane bridge. This has greatly opened up the area to sunlight and improved the ambience of the narrow gauge terminus at the waterfall.Five members of the team were present and produced one giant fire. Mick Kingsley ended his day by cutting the grass on the embankment at Wirksworth's station entrance to very good effect. The PWT, who are pictured, completed the first part of the new crossover installation which will allow Road 1 to be re-opened tomorrow. 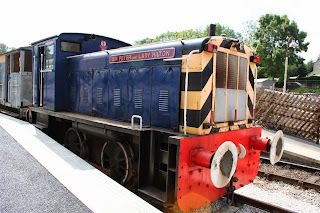 The DST have been turning their minds to overheating axle bearing problems on their two Barclay's and devised a further modification to Henry Ellison that may help. No3 was readied for the coming Bank Holiday weekend and Cathryn had attention to her brake rigging. Stuart worked steadily at machined horn guides for the locomotive. Further work to restore the demonstration wagon at Ravenstor saw the timberwork completed leaving painting to finish the job. 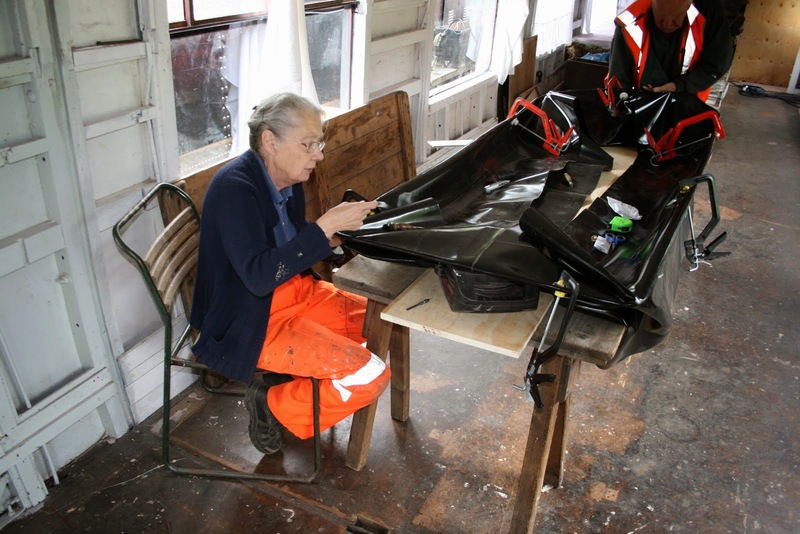 Much work was done to prepare the roof of the 8F's groups support coach for repainting that will enhance the vehicles appearance. Arrival of more paint allowed further two pack glossing of Iris and 50253. The LMSCA continued with roof stick production and at Duffield the new seats are now painted and on the platform there. All this was achieved whilst our service trains ran with their support teams in the Booking Halls and the EVRA Shop. The Pullman Buffet Car looked after today's visitors together with 18 Afternoon Tea customers who were fulsome in their praise for the quantity of food on offer and pleasant way it was all served. 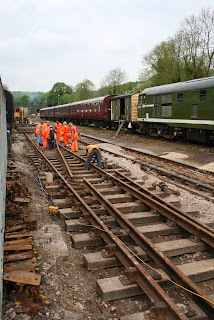 The SBT turned their attention to the central drainage channel on the platform which, when complete, will allow the final fill to be placed and rolled prior to tarmacing. The Booking Hall at Wirksworth had a spectacular day with today's passengers, a Gold Steam Experience purchase and 72, yes 72, bookings for the Station Master's VIP Pullman Luncheon. This latter product only went live on Amazon Local today and it obviously touched the right buttons. To round off the accolades we learnt that we have been awarded Trip Advisor's 2014 Certificate of Excellence based on the warm feedback from our customers. Yet more praise from the first Knight of the Realm to sample an Experience. Well done to the team involved. 'Dear EVR, Just a note to say thank you for an absolutely fantastic day learning to drive the steam engine. It was just brilliant, and Neil is a great teacher. And an excellent lunch unexpectedly included. Lots of "hands on" , beautiful scenery and warm sunshine. Life doesn't get better than that. I would recommend your Experience days to anyone. Another lovely sunny day here in the Peak. We pottered around with visitors and passengers, spreading some general happiness, and the last of our traction engine visitors chuffed off into the wide blue yonder. Down the yard the Austerity received further paint; the EVRA SO received attention; railcar 55006 received its C exam and railcar 50253 received a replacement door pillar amongst much other forward progress. Around the station JCB Purves had a wagon moment, followed by a tarmac moment, followed by a mowing moment. Indeed the mowing moment became a mowing afternoon courtesy of Trent Barton Mango Farmers, so at least the grass is only as high as the nellefants knees now, and the tarmac moment got as far as filling some potholes which have never been filled before in the length of our endeavour. Hi Guys - Wirksworth smelt like a steam Loco Shed this morning but not our Engines,varied types of Traction Engines as seen on Martins Video.The Drivers seem to enjoy The Pullmans bacon butties !!. We entertained a Party from the Vintage Carriage Trust who seemed very interested in our Varietry of DMUs.The Duke and Cathryn had their usual band of Workers.The Class 33 had some paint preparation ready for a repaint before its little Holiday to Keighley and Worth Valley.Wonder whether they dare do it NSE.The DMU group washed a couple of our road rail vehicles, shunted some wagons and carried on with 55006 C Exam. In all a very Busy day. A different location but much mentioned in these missives! Much gardening and weeding was in evidence along the west embankment, also at Duffield and in hanging baskets. However, if anyone feels like some mowing, an extra pair of hands would be useful, the grass is as high as a nellefants eye, and we can't cut it fast enough. The class 33 received routine maintenance and the Station Foreman had a poster session, as well as a tarmac session. will be starting a large chuff of their own tomorrow, leaving for Crich via Whatstandwell at 09.30. A lovely day that brought out a happy multiple painting activity. The roofs of the two Pullman Coaches and the EVRA Mark 1 vehicles had significant treatment to make them much more presentable and the first coat of gloss was applied to Iris after a late night yesterday when both Iris and 50253 had some roof painting. Many thanks to all concerned as we all know that the eyes are drawn to paint peeling off otherwise acceptable rolling stock - we will have the finest roofs in Great Britain! The VCT neared the end of their splendid project north of Cemetery Lane transforming a former dank and dark area to one where the sun now shines down on the north end of the line. The PWT made strides into one half of the relocated crossover and today's photo shows the lesser spotted Birtwistle as part of the team. Tom kept our books prior to Angela taking over the task and hasn't been amongst us for a couple of years. The dmu team commenced a the long process of giving 55006, the "bubble car", a "C" service and 51188 together with 51073 had battery isolating switches fitted. At Duffield the Boultbees had an impact with hanging baskets hung, planters planted, weeds weeded, the toilet block given a Spring clean and new posters displayed. All good stuff! The Pullman Buffet had a steady stream of visitors and the Booking Hall gathered another silver steam experience. Mick Thomas looked after today's customer with yet another unusual machine which travelled rather slowly ensuring quite a long day for him. PPS - the bar that is an intergral part of our rail bender - the Jim Crow - seems to have been gathered. If anyone has taken it or seen could they please step forward! A glorious day in the Gem of the Peak with the peace only broken by the telephone continuously ringing. Actually, that's not quite true. The phone did indeed ring quite alot but the buffet was pretty busy for most of the day too. The Pway team worked on the new pointwork when not spending several hours talking to visitors about the intricacies of rail. Down at the engineerium, work pushed along on Iris and 50253. Having been sanded yesterday, Iris received 2 pack undercoat to the No.2 side and gloss to the roof. But because the paint was already flowing, 50253 was receiving the same treatment on the No.1 side. 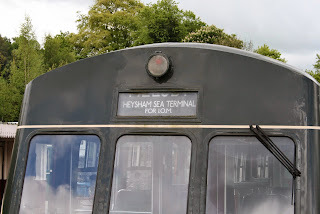 I noticed the destination blind on the 3 Car set reminded me of my seafaring days so there are two photos attached to indulge this interlude! The day was punctuated by very heavy showers making progress even more difficult than usual but the DST battled on with Cathryn's bits and lifted Henry Ellison to replace a bearing that had run hot over last weekend. Fred & Iris, bless them, gave the Mess Hall yet another deep clean and tended to our planters at Wirksworth. There was frenetic activity in the Maintenance Facility as Iris had its west side and roof sanded down with roof paint being applied in the late afternoon. 50253 also had attention to its roof as did the LMS Brakevan which has been re-felted. A great effort by all concerned. The PWT also had a most productive day as the No 1 Road side of the new crossover began to look like the finished product. Not an easy task to reconfigure the geometry of the ironwork. Tuesday is a service day which saw a pleasant number of passengers including a party from the Derby Wine Circle, a hobby close to my heart. The service was supported by the Booking Halls at Wirksworth and Duffield, the EVRA shop and the Pullman Buffet Car which also welcomed 26 Afternoon Tea clients. The LMSCA kindly agreed to mastermind the shuttering on the windows of Faraday and 11520 to allow them to be safely stored north of Cemetery Lane bridge in the fullness of time. They also continued to use the Third Open as a sales stand during the day. 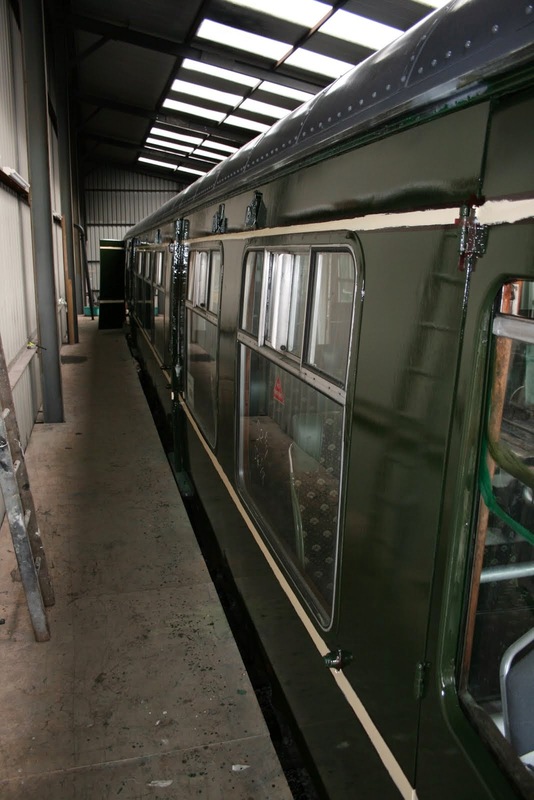 There is a lot to this carriage restoration job! The EVRA Mark 1 coaches received further work to their roofs in between the heavy downpours and the VCT fielded 6 men, felled much timber and had one giant fire at their Cemetery Lane site. hardly adequate to the task. 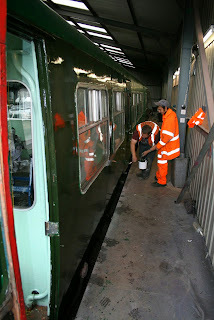 Down the yard, the DMU team painted the ceiling of 50253 again and carried out some work on the vents. The class 31 received further attention to its brake cylinders. and eventually grew a little weary of picking up bits of red ribbon and burst balloons, not to mention finding strange notices and stress balls, which had been given out in their hundreds yesterday and were a source of stress today, being often lodged in random and remote tight spots beyond the reach of the tweakers. No doubt these will in due course prove a source of entertainment for the station cat, Spank. The platform and quad area are more or less back to normal but the two low-flying gazebos have been reduced to one, the other having had an argument with the shop roof, which it lost. 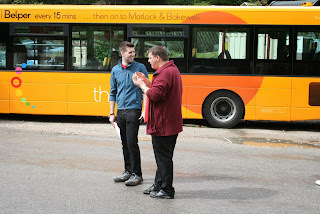 An incredible day and very much a first for our enterprise saw the culmination of months of planning with the Trent Barton Big Bus & Train Bash that filled Wirksworth with many strange sights and sounds. Special thanks go to Leigh pictured cluching one of his many snacks who, together with Tom Tait, orchestrated the event from start to finish. I am immensely pround of the whole team who actively participating in delivering our biggest event ever. The train crew had a particularly long day with five round trips to Duffield, intense activity on Ravenstor and crewed both No3 and Henry Ellison with good humour and dealt with the demands placed upon them throughout the day. The miniature and narrow gauge railways were in action as were the Booking Halls at Wirksworth and Duffield together with the model railway and EVRA shop. The LMSCA were able to show off their splendid Third Open and sell goods to raise funds for further work. Catering rose to the challenge with a burger stall in addition to the Pullman Buffet achieving pleasant financial results. The support team were also important as they dealt with all important parking and general sorting out of a miriad of problems that arise from an event of this size. Derby and District Amateur Radio Society added extra interest at Duffield. Three cheers to all concerned in conditions that were less than ideal! Sunshine and torrential showers pepered the day but spirits were not dampened. A day of odd showers and sunny spells saw us pottering up and down with the day's driver experience guests, but the main thrust of the day was a large number of tasks towards tomorrow's major event, with everything arriving from roundabouts to burger vans. 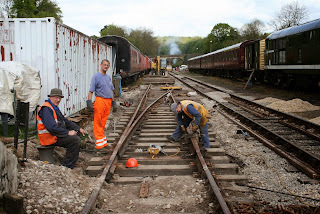 In the background work continued on lever frames for Shottle and in preparing the LMS Third Open for its first public viewing after its paint job. 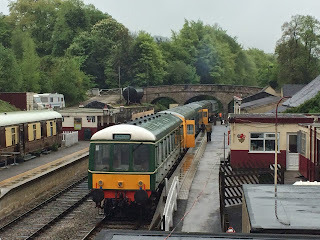 A damp day which featured a big shunt involving both LJ Breeze and 33035. The aim of the shunt was to position everything ready for the Big Bus and Train Bash on Saturday. The LMS TO was pulled out as the LMSCA are having a stall/display inside, the coaching stock was filed away and a six-car DMU set was constructed in anticipation. Meanwhile, the Booking Office continued with preparations for the event including sign production and gazebo erection. It was nice to welcome Millside Radio, a hospital radio station who will be broadcasting live from the event on Saturday; they performed some test broadcasts via the 3G mobile network to their base in Mansfield. All successful and quite impressive! The DMUs were all cleaned ready for their role too. The PWay team had another day of great progress on the new pointwork, as did the VCT who have created a view now. One can stand on the platform and see through to the end of the line. Today's photograph is the six-car DMU stabled up, with toilet filling, cleaning and general fettling going on. Another production from the Wirksworth Studios showing the Class 33 in action today - enjoy! A much less frenetic day than yesterday where the PWT continued with the new crossover project that is illustrated. This does require quite a lot of people as it is very labour intensive to accommodate the intial placement of crossing timbers but so far, so good! The Pullman Buffet Car also had a gentle day after their major efforts yesterday and the Booking Hall continued to tend to the ever ringing telephone. Much work has been going on in the background to create our next new catering product which will excite all who are tempted by it. Watch this space! The unsung heroes, Fred & Iris, cleansed the Mess Hall and then went on to tend to our planters around Wirksworth Station and they are rightly featured today. Our scheduled services were well supported and thanks go to the train crew, booking halls at Wirksworth and Duffield together with the EVRA shop. They all gather much needed cash and leave our passengers with a good feeling that they are really welcome and valued that enables our enterprise to move forward and thrive. They were also supported by the Pullman Buffet Car who entertained a further 24 happy Afternoon Tea customers and it was good to see Angela back in action after a difficult few weeks. It was a good indication of the railway family we have developed over our short history. The VCT were out in force to continue with their clearance of the area north of Cemetery Lane bridge revealing and area between the upper and lower levels that I am sure could host a small terrace in the future. They also dealt with irritating new growth at the north end of the dust dock allowing good vistas of the Yard from Saturday's fun fair area. The DST laboured on with Cathryn by removing the boiler support structure from the frames and renewing the firebars in No3.The dmu team were engaged in the preparations for Saturday's excitements and completed the sanding down of the east side of 50253. There was much stimming and mowing involving the Head of Security, Mick Kingsley and Anton to ensure we are as presentable as we can be for Saturday and Duffield reports further progress with seat painting. All in all a very good sunny day. The third day of the May Day Bank Holiday held good promise with the weather but it never really warmed up to encourage those extra visitors. Nonetheless, we had quite a good day with the Rocks & Rails joint effort with The Steeple Grange Light Railway drawing in some new customers. My thanks go to Vince Morris who stoically joined the two enterprises together. Our services today with the 3 Car set on the Duffield line and Henry Ellison trundling to Ravenstor performed well supported by the EVRA Shop and "Bric a Brak" opportunity in the Training Room together with the Narrow Gauge and Model Railway. All involved deserve our thanks as the coffers were swelled during the day. The Booking Halls at Wirksworth and Duffield with the Pullman Buffet Car also contributed that vital factor of collecting the money. The dmu team were most helpful in clearing a quantity of pre-cut ivy from the area outside the Booking Hall to the burning site and achieved the painting of some seat frames together with the sanding down of 50253 on its east side. PS - today's photo is a little blast from the past in honour of Faraday which performed sterling work for some nine years which was due to Martin Bromley's generous purchase of the loco for our use. It was named to recognise the support of the late Lady Hilton who was shareholder number 1 in the far off days of 2002. Perhaps one day someone will take on the project of restoring this special loco to life again. A quite pleasant dry Star Wars Day brought out an improved number of visitors to our fine railway, and the till could be heard ringing gently in the distance even from the parlour of the Malt Shovel. 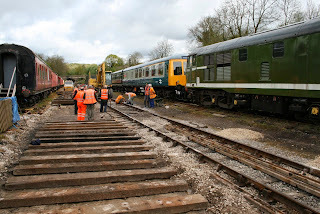 Down the yard, the class 31 received a routine inspection to its brake cylinders while various things chuffed past. 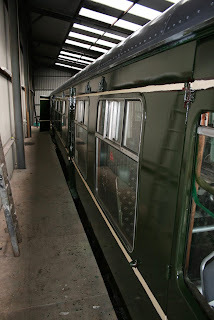 In the shed, the DMU team painted the ceiling of the south end compartment of 50253 and Formica Field finished the vestibules, another vehicle stripped of the orange peril. We have had glorious weather for day one of our Rock and Rails weekend in association with the Steeple Grange Railway. 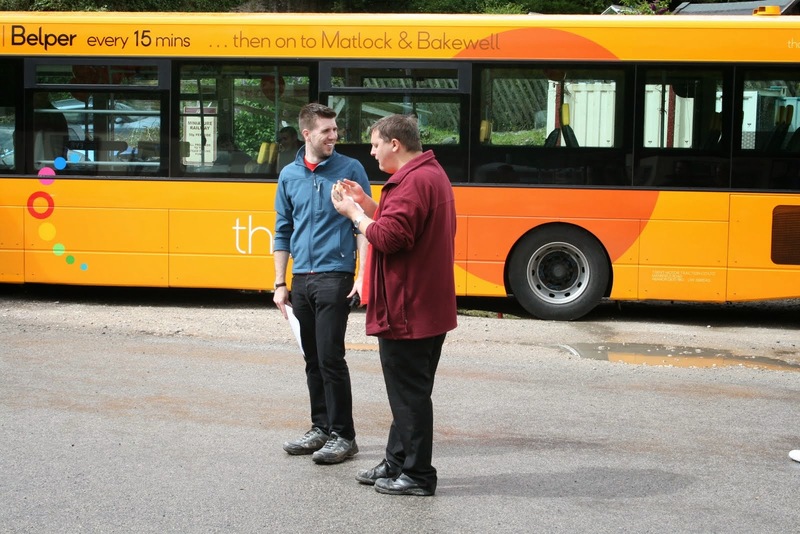 Our quarry tours proved quite popular and we received good feedback from our guests. Down the yard the DMU restoration group were busy repairing the roof of 50599 roof, replacing the ceiling panels on 50525 as well as replacing windows on 50253. The LMSCA commenced a clean up operation of the 3rd open in preparation for their stall tomorrow and work continued on the SO and SK roofs. The 8F group carried on with their work on Cathryn and Tim Oaks et al were busy reaming holes in the Duke's frame and painting frame steps and axles. Today's picture is of one of our passengers, Bertie aged 10 who proved a big hit with his fellow visitors and our volunteers alike. Apparently he is very well travelled. A relatively peaceful sunny Friday apart from the phone wearing a hole in the desk. 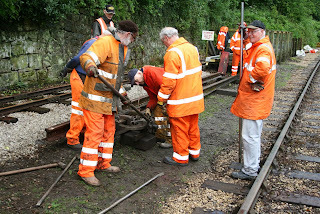 We entertained a number of Steam Driver Experience guests which gave the station an impression of activity. vast Aunty Wainwright Emporium in the Training Room and the replacement of antimaccassars in the units being used for the weekend. Can I remind train crew that litter should be removed from units prior to them being put away for the night. Down the yard the newly motorised Smiths Industries was dealing with carriage roofs and the European Vice President of the LMSCA was finishing off the replacement of seats in the SK as well as removing light fittings for cleaning. Nearby, the Head of Signals and Telegraphs was cogitating the interlocking of levers for the multi-million pound resignalling scheme for Shottle. Staff please make a note in the diary of any further bookings for Vince's walk on Monday. 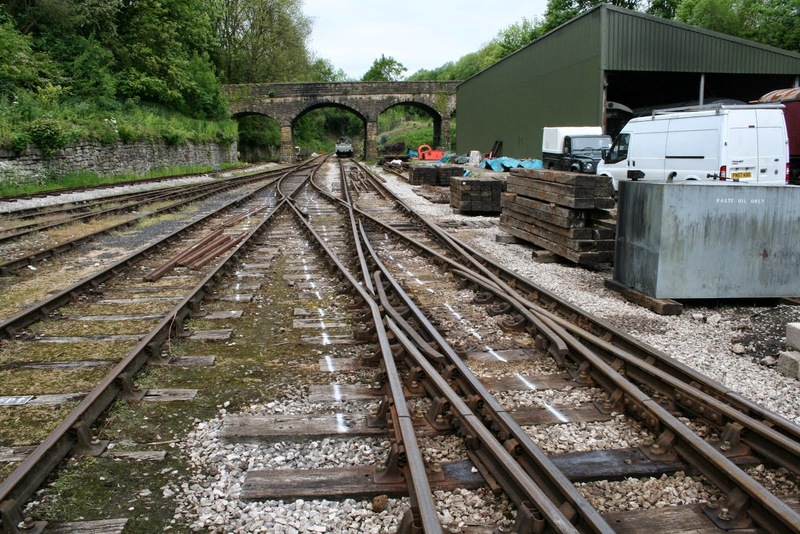 For those of you who may be bored on Monday, Vince Morris will be guiding a three hour walk "Rails and Quarries of Wirksworth" starting at 12.30 (£3 donation) from the station quad. Stout shoes or boots are advised as well as strong underwear. Oh sorry, it doesn't say strong underwear. There will be two shorter guided walks around Steeple Grange approx 30-40 minutes by Robin Jeffcote at 12.00 and 14.00 from Ravenstor Station on Saturday, Sunday and Monday, no booking is required, just turn up. First day of May and what a May it is going to be! We have Rocks and Rails this weekend, the Big Bash next week, traction engines the weekend after, followed by another Bank Holiday and our Cheese and Wine Special! Back to today and the DMU team spent the morning doing a shuffle with the coaches, before attending to a leak on Class 108 E50599 so that it will be OK this weekend if it rains (although of course we don't want it to rain as we have an event on, although one could exercise the new Rainy Day Guarantee anyway). Also in the yard, the PWT assisted with a remote part of the Shottle project and the VCT had a multi-fire day in their quest to open up the bank between the former headshunt and the incline line north side of Cemetery Lane bridge. The Booking Office dealt with yet more Amazon enquiries and items relating to this weekend's event and the Big Bash. I will leave you with a reminder video from our friends at trent barton about the Big Bash next week.